This black comedy pits a pair of hapless knuckleheads against the vast and wealthy machinery of official corruption. It's not exactly a fair fight, but it makes for a movie that is funny, textured, and rich with symbolism. Photographers Vinod (Naseeruddin Shah) and Sudhir (Ravi Baswani) are struggling to get customers into their portrait shop when opportunity knocks - a tabloid editor Shobha (Bhakti Barve) hires them to snap stealthy shots of the surreptitious meetings between the corrupt Municipal Commissioner D'Mello (Satish Shah) and the real estate developers who bribe him for construction permits. First the photographers discover a bidding war between rival developers, the slick Tarneja (Pankaj Kapur) and drunken Ahuja (Om Puri). When the competition escalates to murder, Vinod and Sudhir are determined to fight the good fight and expose the crimes and corruption they have discovered. But they find themselves in a perilous tangle of deals and double-crosses, where everyone is on the take. 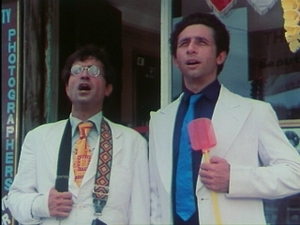 From the outset Jaane bhi do yaaro ("Let it go, friends") has the tone of a zany caper. Its guileless heroes zigzag their way from bluffing into D'Mello's home to photograph secret documents, to chasing a wayward corpse, to staging an impromptu takeover of a theatrical production of the Mahabharata, and each stop on the journey is more hysterical than the one before. But the prevailing mood of the film, and presumably of its audience as well, is that the bumbling efforts of feckless interlopers, no matter how well-meaning, is not enough to jam the well-oiled gears of official corruption. The film strikes a nice balance with a madcap approach to a weighty subject; Vinod and Sudhir's naive earnestness is funny and charming. And it's not just farce and slapstick; there are layers of meaning even in the silliest scenarios. My friend Amit at Cross-cut has a nice comment on the complexity of the Mahabharata scene, for example, in which the film's characters usurp the stage performance of a familiar myth. Amit notes that this is a metaphor for the people of India who sit and watch passively as the spectacle of corruption is carried out before them. While the characters are engaging and the antics side-splitting, Jaane bhi do yaaro's message is ultimately very bleak, with a flavor of no good deed going unpunished. It is an excellent, entertaining, and provocative film, but be prepared for a sucker punch or two amidst all the mirth.